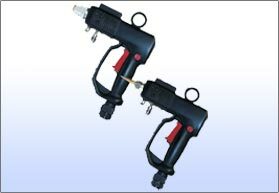 A durable, lightweight handle and molded high-temp nylon shell protects the operator from heated components and allows for easy operation. A 360-degree hose swivel allows for optimum movement and eliminates hose twisting. A wide variety of handgun nozzles (both standard and extended) with varying orifice diameters available including multi-orifice nozzles.